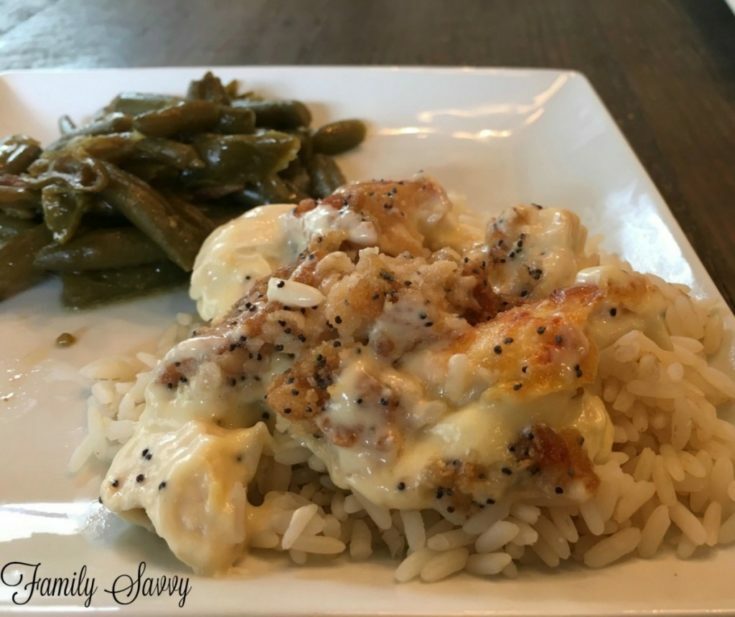 This delicious poppy seed chicken casserole recipe is in many a “church cookbook” and on many a potluck or picnic table in the South. Poppy seed chicken is one of the most popular Southern comfort dishes. 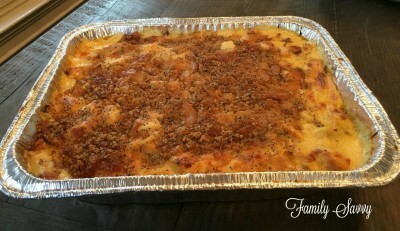 Go to any church potluck or large fellowship meal, and most likely you’ll see several poppy seed chicken casseroles. There are myriad recipes for poppy seed chicken, most using some combination of soup (cream of chicken or cream of mushroom), sour cream, and/or mayo. I’ve tried many versions, and this one is our family favorite. I always use 98% fat free cream soup and reduced fat sour cream. This considerably reduces fat without compromising flavor. Make ahead: This dish is perfect to make ahead and freeze. Simply prepare the dish to the point of baking, wrap well, and freeze for up to 2 months. Thaw in the fridge a day or two before baking, or bake from frozen (which will require an extra hour or so of cooking time). If you want the cracker crumb topping to be really crisp, it is best to make it before baking. If you freeze it, just be sure to broil the casserole at the end of baking to crisp the crumbs sufficiently. Poppy seed chicken is a perfect dish to take to a new mom or someone sick at home, as it is comforting and rich without being spicy. I serve this poppy seed chicken over rice and with these cheese & chive biscuits, these Mississippi Green Beans, and a favorite green salad. If you try this, I’d love to hear your thoughts! If you have a favorite version, feel free to share it as well. As always, thanks so much for stopping by. Be blessed, and stay savvy!!! A tried and true family favorite that has graced many a Southern table. Mix soup and sour cream until well blended. Sprinkle chicken with salt & pepper to taste. Stir chicken into soup mixture until well blended. Spoon mixture into lightly greased 11- x 7-inch baking dish. Stir together cracker crumbs, melted butter & poppy seeds. Spread crumb mixture over chicken mixture. Bake at 350Â° for 35 to 40 minutes or until hot and bubbly. Hi Diane! Thank you so much for your sweet comments! I hope you enjoy the dish, and Happy New Year to you as well!!! Thanks Jamie – this looks beautiful and delicious! Can’t wait to try this recipe. Thank you for the wonderful recipes and tips you posted throughout November and December as well! Happy New Year!